SEATTLE—Introducing the latest seasonal drink to its menu, Starbucks announced Monday that the company is now offering a new lukewarm coffee to help ease customers’ transition from iced to hot beverages. 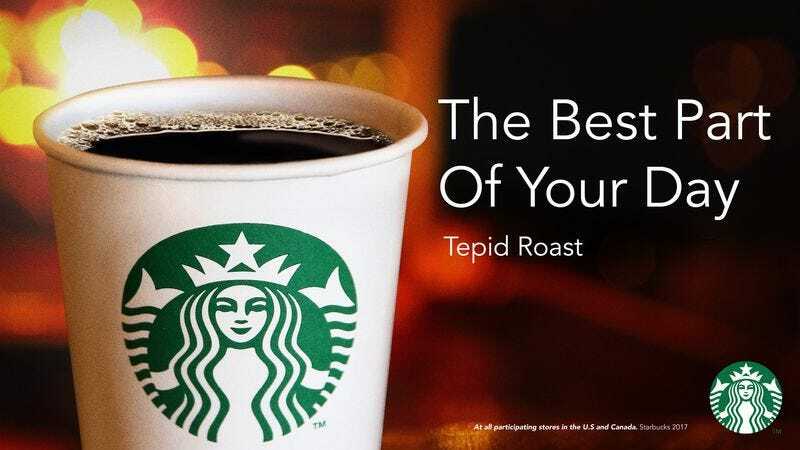 “Our new Tepid Roast will be available for a limited time in select cities where temperatures have started to dip between 70 and 60 degrees Fahrenheit,” said spokeswoman Heather Grant, adding that the fairly recently brewed coffee, which has been left sitting out on the counter for a while, is already available at Starbucks locations in several Northern states experiencing weather that’s not warm enough for an iced caffè Americano but also not really chilly enough either to order a hot latte. “In most places, our room temperature coffee will only be around for a couple of weeks while the weather is mild, so we encourage customers to visit their local Starbucks to get one while it lasts.” Officials confirmed that due to the promotion’s early success, the company was already making plans to bring the lukewarm coffee back to Starbucks menus in the spring.